Problem: Water penetration from ice damming. Ice damming is the build-up of ice at the edge of the roof, caused by heat escaping from the house and melting snow that accumulates on the roof. This water flows down the under the snow covering the roof. As it reaches the outer edge of the eave over the cooler soffit area, it freezes, creating an ice dam. This ice dam stops the melted water from reaching the eave. Ice then builds up in the form of icicles and slabs and the melted water can back up through the shingles and leak into the attic if adequate eave protection is not used. Solutions: Adequate levels of insulation over the exterior wall in combination with ventilation between the insulation and the roof sheathing will prevent ice damming. Eave protection can also help prevent damage as shown in Figure 12.
ice and water shield products. Install eave protection on shingle, shake or tile roofs and extend it from the edge of the roof a minimum of 36 inches (900 mm) up the roof slope to a line not less than 12 inches (300 mm) inside the inner face of the exterior wall. Low voltage heating cables can be used in valleys to help keep the valleys clear of ice and snow (Figure 12a). The use of high heel trusses will allow for extra insulation over the exterior wall. This will reduce the amount of heat loss form the house to the attic, decreasing the melting of snow on the roof. The use of prefabricated baffles will allow for air flow between the ceiling insulation and the underside of the roof sheathing. 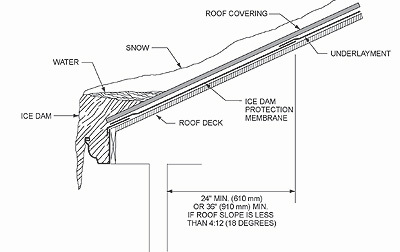 This will keep the roof surface cooler and help reduce the amount of melting as shown in Figure 13. 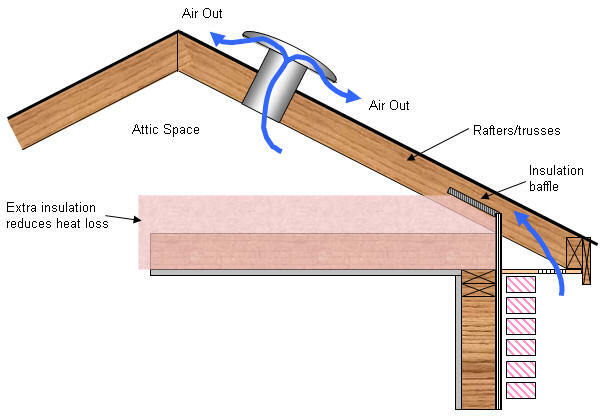 Figure 13 - Insulation and Ventilation Will Maintain Lower Roof Temperatures.